11926: A. A. Waterman twist-filler: gold filled filigree slip-cap, 14.6 cm long, hard rubber glossy and unfaded with strong imprints, only slight posting scratches, metal crisp and unbrassed, monogram skilfully engraved in indicia; #2 nib with distinctive three-lobed vent hole. 12182: A. A. Waterman twist-filler: large gold filled filigree slip-cap, 15 cm long, clean metalwork, hard rubber lightly and evenly faded, noting marks and wear to the filler knob. Replacement warranted nib is a good writer. 12338: American Pencil Co. pencil case: wooden holder, 29 cm long, in the form of a giant pencil with a screw-on nickeled brass end cap; faux woodgrained finish, marked "PATENT/APPL'D FOR"; dings to end cap, partial split to mating ferrule (see details). 12335: American Pencil Co. No. 19 "Midget" dip pen: giant novelty pen, 29.5 cm long including nib, plated brass ferrule, usual cracquelure to swirled lacquer finish, nib has a bit of superficial rust but is overall quite clean, fragments of decal next to ferrule identify pen as souvenir from Lookout Mountain. 10508: Arnold Fountain Safety Razor: patented portable razor in the form of an oversized black chased hard rubber pen, complete with gold filled cap band; 15 cm long, crisp chasing and imprints, moderate fading; blade holder unscrews to allow blades (not included) to be replaced. 11163: Arnold Fountain Safety Razor: patented portable razor in the form of an oversized black chased hard rubber pen, complete with gold filled cap band; 15.1 cm long, blade holder unscrews to allow blade to be replaced. Hard rubber has been professionally reblackened. 8659: Autopoint tab-filler: black and pearl, 13.9 cm long, gold filled trim, excellent color and like new but for slight plating wear to lower cap band; an extremely rare fountain pen, of the highest quality, made by the Autopoint company of Chicago, primarily a pencil company; big smooth #6 Autopoint nib, filler mechanism similar to that of contemporary Auroras. 13068: B. B. Stylo stylographic pen: black chased hard rubber ringtop with unusual "swing-filler" (the lever pivots sideways), apparently invented by Julius Held (read more here); 11.7 cm long, gold filled trim. New old stock, but moderate fading to hard rubber. 13074: B. B. Stylo stylographic pen: black chased hard rubber with unusual "swing-filler" (the lever pivots sideways), apparently invented by Julius Held (read more here); 11.2 cm long, gold filled trim. New old stock, but slight swelling to cap above clip, end of barrel out of round. 13076: B. B. Stylo stylographic pen: black chased hard rubber with unusual "swing-filler" (the lever pivots sideways), apparently invented by Julius Held (read more here); 11.2 cm long, gold filled trim. New old stock, but slight swelling to cap above clip, end of barrel slightly out of round, some fading to hard rubber with shadow from now-missing original price band on cap. 13077: B. B. Stylo stylographic pen: black chased hard rubber with unusual "swing-filler" (the lever pivots sideways), apparently invented by Julius Held (read more here); 13.1 cm long, nickel plated trim. New old stock, but a stress mark from the clip hole, heat distortion to the cap, end of barrel slightly out of round, some fading to hard rubber with shadow from now-missing original price band on cap. 13072: B. B. Stylo stylographic pen: black chased hard rubber with unusual "swing-filler" (the lever pivots sideways), apparently invented by Julius Held (read more here); 13.2 cm long, nickel plated trim. New old stock, but a stress marks from the clip hole, heat distortion to the cap, fading to hard rubber with shadow from now-missing original price band on cap. 13071: B. B. Stylo stylographic pen: black chased hard rubber with unusual "swing-filler" (the lever pivots sideways), apparently invented by Julius Held (read more here); 13.2 cm long, nickel plated trim. New old stock, but a couple of stress marks from the clip hole, some pitting to clip, fading to hard rubber with shadow from now-missing original price band on cap. 13064: B. B. Stylo stylographic pen: black chased hard rubber with unusual "swing-filler" (the lever pivots sideways), apparently invented by Julius Held (read more here); 11.1 cm long, nickel plated trim. New old stock, but heat distortion to cap, end of barrel slightly out of round, fading to hard rubber with shadow from now-missing original price band on cap, stress mark from clip hole. 13075: B. B. Stylo stylographic pen: black chased hard rubber vest pocket model with unusual "swing-filler" (the lever pivots sideways), apparently invented by Julius Held (read more here); 11.1 cm long, nickel plated trim. New old stock, moderate fading to hard rubber, end of barrel slightly out of round. 13065: B. B. Stylo stylographic pen: black chased hard rubber with unusual "swing-filler" (the lever pivots sideways), apparently invented by Julius Held (read more here); 11.2 cm long, nickel plated trim. New old stock, but slight heat distortion to cap, fading to hard rubber with shadow from now-missing original price band on cap, nick to surface right below. 10782: Baignol Tank 400: unusual French oversize eyedropper-filler, 14.8 cm long, originally sold with multiple interchangeable transparent Lucite barrels pre-filled with ink; original gold-plated stainless steel Baignol semi-tubular nib, truly enormous ink capacity. 13554: Brown & Bigelow dip pen: aluminum, 16 cm long excluding plated nib, an advertising item marked for the Hotel Sutter in San Francisco. Brown & Bigelow were later known as the makers of the Redipoint mechanical pencil, but they had previously had a long history of making aluminum promotional items of all sorts. 13284: Camel ink-pellet button-filler: green-veined pearl with black ends, 12.6 cm long, gold filled trim; classic barrel imprint with two camels drinking logo, same design on the nib, with second later imprint on other side of barrel. The ink pellet compartment has been sealed shut with wax to keep it ink-tight for use as a regular button-filler; to open for use with ink pellets, section should be removed to give full access to the filling mechanism. Some staining to the cap, but barrel color is excellent. 13649: Camel ink-pellet button-filler: red and tan-veined silver pearl (same material as Waterman's "Steel Quartz"), black ends, 13.7 cm long, gold filled trim; bold classic barrel imprint with two camels drinking logo, same design on the nib, with second patent imprint on other side of barrel. The ink pellet compartment has been sealed shut with wax to keep it ink-tight for use as a regular button-filler; to open for use with ink pellets, section should be removed to give full access to the filling mechanism. Clip is tight to the cap but wiggles slightly side to side. 13475: Cattaraugus knife pencil: red-veined cream celluloid body, chrome plated trim, 12.8 cm long, uses 1.1 mm lead; one cutting blade and one nail file, good snap to both, plating losses to nose cone,celluloid is excellent with beautiful color. 12056: Crocker blow-filler: black chased hard rubber slip-cap, 13.1 cm long, early and unusual example with New York imprint, narrow keel feed, hole in cap top so pen can be filled with cap posted; crisp and glossy, bold imprints and chasing, nib imprinted "THE/CROCKER/N.Y." with scrolling flourishes, has tipping but hairline from vent into imprint. 12827: De La Rue bottle stylo: black hard rubber novelty pen, 7.4 cm long, eyedropper-filler, imprinted "FROM/ALDERMAN A. BYRNE.T.D./DUBLIN" -- famous Irish politician Alfie Byrne, later Lord Mayor of Dublin. "TD" stands for Teachta Dála, a member of the lower chamber of the Irish Parliament. 11210: Dunhill Twopen: English-market version of the legendary Zerollo double-nibbed pen; helically-chased black hard rubber, 13.1 cm long, gold filled trim. Crisp imprints, fully marked, both nibs very soft and flexible. 12364: Dunn pump-filler: black chased hard rubber, 11.5 cm long, gold filled trim, orange hard rubber filler knob, crisp chasing and imprints; came to us lacking the nib but never filled, has been recorked and a correct #2 Dunn nib installed. 12342: Dunn pump-filler: uncommon long and very slender model, black chased hard rubber, 14.3 cm long, gold filled trim, orange hard rubber filler knob, crisp chasing and imprints with a slight price band shadow on the cap (see detail); came to us lacking the nib but never filled, has been recorked and a correct #2 Dunn nib installed. 12745: Dur-O-Lite pencil and utility knife set in box: light greenish pearl celluloid Eversharp-style faceted pencil, 14.6 cm long, chrome plated trim, with matching slide-action two-bladed Dodson utility knife; both pieces imprinted with a phone number but apparently unused, some age spots to plating, pencil barrel bent, with some discoloration to the eraser cap and some small age shrinkage cracks at ends (see details). 13316: Eagle Correspondent: unusual end-joint black chased hard rubber eyedropper-filler, 13.3 cm long, hard rubber is crisp and glossy, with strong imprints, excellent but for some scratching to the nib's surface; see this Pen Profile for more information. 11199: Eagle (?) Pepsi-Cola advertising pen: colorful lever-filler, 12.4 cm long, gold plated trim, typical paint loss to metal clip in form of Pepsi bottle, plated steel nib. 13629: Edward Todd telescoping ruler pencil: sterling silver ringtop, 11.3 cm long, square body ruled to 3 5/8 inches, extends to 32.5 cm to measure a full 12 inches; hand-engraved numbers, 1897 patent date, uses standard 2 mm thick lead. Early production, unusual size, only example we have handled that is three-draw, rather than two. Ringtop attachment appears to have been resoldered in the past (see detail). 10417: Edward Todd dip pen and pencil combination: sterling silver, 16.1 cm long excluding nongold nib, end of taper twists to extend 2.0 mm lead. Nice substantial proportions, sharp scroll relief decoration, fully marked on ferrule, with engraved name "EMILY". 10460: Eisenstadt lever-filler: unusual black chased hard rubber oversize pen with distinctive reverse-action lever; 13.6 cm long, no brassing to the gold filled trim, hard rubber moderately faded, barrel imprint lighter to the left but fully legible, scratch in top of cap (see detail); big #6 nib is fully marked, including logo of "E" and try square; Eisenstadt was primarily known as a leading St. Louis jewelry company: their pens were of high quality, but limited in production and distribution; the "PAT. PENDING" imprint indicates production before the approval of patent 1,531,800 on March 31, 1925. 13563: Eversharp CA ballpoint demonstrator: transparent barrel, brushed stainless steel cap and barrel end cap, gold filled clip, 13.1 cm long, maroon nose cone, original refill is intact but nonfunctional. 11762: Ingersoll twist-filler: oversize flat-top, 14.1 cm long, gold filled trim, an unusually fine pen for a company best known for economy models -- the same company behind the one-dollar pocket watch. Knob under blind cap is twisted to empty out sac, released to allow sac to fill. Nib is small but solid 14K gold, and a good writer. 12819: John Holland 71: black hard rubber hatchet-filler, hand-engraved gold filled overlay, 13.7 cm long, add-on Holland clip, #12 nib is a responsive semiflex capable of a nicely shaded line. 1915 patent date imprint on barrel overlay, monogram engraved in barrel cartouche, metal clean, no brassing. 12691: John Holland 75: uncommon oversized black chased hard rubber hatchet-filler, 15 cm long, nickel plated hatchet, wide gold filled cap band; originally clipless, came to us with a 1910-patent slip-on clip, included. Even fading and wear, imprints all legible, Holland #15 nib takes deliberate pressure to open up, more of a semiflex for ordinary use. 13572: John Holland 73: large black chased hard rubber hatchet-filler, 14.9 cm long, nickel plated trim; good imprints and chasing, responsive #3 nib writes an elegant line, moderate even fading, unusual size. 12449: John Holland 72V: black chased hard rubber ringtop hatchet-filler, 11.45 cm long, gold filled trim, 1915 patent date imprint. 12602: John Holland 72: black chased hard rubber ringtop hatchet-filler, 11.9 cm long; gold filled ringtop filling may be a post-factory addition. Strong imprints, Holland #12 nib. 12437: John Sheldon compendium: scarce and desirable Birmingham-made combination dip pen, pencil, coin gauge, toothpick, wax seal, and letter scale (British weights and rates), 10.1 cm long closed, sound condition noting weak imprint, slight bump in upper barrel; February 1842 patent date only very partially visible, struck at an angle, purple faceted stone in crown. 13894: LeBoeuf Holy Water Sprinkler in box: black sleeve-filler,12.6 cm long, gold filled trim, new old stock, size of #8 pen, usual slight age shrinkage around barrel end plug (see detail). 11043: Mabie Todd Swan Leverless demonstrator: rare transparent celluloid version of the classic British twist-filler, 13.6 cm long, black hard rubber ends, #2 size, not sold to the public. Some plating flaking to the entangling bar, barrel mouth is quite fragile with multiple stress lines visible. 10544: Manos Ajano: smooth black celluloid piston-filler, 13.7 cm long, made in Austria, steel dip pen nib, piston mechanism turns but not guaranteed ink-tight or functional; slight barrel warpage and swelling. These pens were widely exported in the early 20th century and are found under various brand names, but are nearly impossible to repair. 12606: Montblanc 432: rare piston-filler stylographic pen, 12.8 cm long, gold filled trim, in scarce and desirable "platinum" celluloid; weighted needle is intact, ink window transparency is excellent, new cork seal has been installed. 13095: Parker 45 demonstrator: transparent barrel and shell, brushed stainless cap, gold plated trim, made in USA, "M" marked stainless steel nib unit. Barrel imprinted "GREEN'S JEWELRY", includes early fat metal squeeze converter. Moderate darkening to shell, usual slight narrowing in center from cap clutch pressure. An uncommon demonstrator, seen much less often than 51 or Snorkel demonstrators. 8370: Parker Jotter saccharine dispenser: hard to find pocketable sweetener carrier, 11.4 cm long, transparent barrel, brushed steel cap, chrome 45-style clip; new old stock, minimal shop wear. 12752: Pelikan 60 pencil: dark green, 11.8 cm long, gold filled trim; singular "Knickebein" mechanism advances lead when pencil is "bent" between the fingers (see video here); a real conversation piece, quite scarce and desirable, uses 1.1 mm lead. "PHILIPS" imprinted on barrel, tool marks to nose cone. 13565: Pelikan 60 pencil: dark green, 11.9 cm long, gold filled trim; singular "Knickebein" mechanism advances lead when pencil is "bent" between the fingers (see video here); a real conversation piece, quite scarce and desirable, uses 1.1 mm lead. 12386: Pen-O-Pencil Twinpoint combo: gold pearl and black marbled lever-filler, 14.9 cm long, gold filled trim, casein color band on barrel, nice strong imprint with "PAT. APP. FOR", pencil uses 1.1 mm lead, #4 Twinpoint nib is a responsive writer; a hairline crack in the cap lip has been repaired nearly invisibly, the only trace being a line resembling a faint scratch (see detail). 12887: Ruxton Multi-Vider Executive slide rule pencil: black bakelite with gold-filled trim, 16.1 cm long, uses 1.1 mm lead; unlike on most Multi-Viders, the crown pulls straight off with no bayonet-style twist lock, nozzle is two-part and lead is extended by turning the base part, and counterclockwise. As new with minimal storage wear, clip rivet holes drilled but no sign of clip ever having been installed -- purchased by us as part of a group of factory experimental pieces. Instructions and further info here. Three available. 13555: Ruxton Multi-Vider slide rule pencil: black bakelite with silver-filled trim, 16.5 cm long, uses 1.1 mm lead, lead reservoir revealed by sliding open the body; some plating wear, used but not abused, fully functional. Instructions and further info here..
7187: Schnell Penselpen: striking red and pearl pen-pencil ringtop combination, 14 cm long, gold filled trim, distinctive sliding bar filler, pencil end uses 1.1 mm lead; correct original nib and patent feed; sac removed to preserve near-perfect color. 12405: Sheaffer Craig: rare full length black chased hard rubber coin-filler, 13.7 cm long, warranted #3 nib, narrow keel feed, crisp and glossy, condition like new but nib is cracked at the heel and is not suitable for use as is. The coin-filling system was never used by Sheaffer for its own-brand pens, and is seldom seen in their Craig sub-brand either. 10588: Sheaffer Craig: rare full length black chased hard rubber coin-filler, 13.4 cm long, warranted #3 nib, narrow keel feed, mechanically sound, evenly faded, more wear to barrel but imprint clear; the coin-filling system was never used by Sheaffer for its own-brand pens, and is seldom seen in their Craig sub-brand either. 6520: Waterman Remex Self-Filler No. 101: one of Waterman's earliest self-fillers, and so rare that most advanced collectors have never seen a complete example; construction is all-aluminum, with a hard rubber press-fit section assembly, sleeve rotates rather than slides to expose filler bar; this example is new old stock, and the hardened sac is preserved with the pressure bar laced in place exactly according to the William Ferris patent 799,897 of 1905 (Ferris' patent 950,817 of 1910 is the one covering the usual Waterman sleeve-filler design); 14 cm long, superficial shop wear, "PAT. APPL'D FOR" imprint. 10242: Waterman 12P: rare mottled hard rubber pump-filler, 13.8 cm long, good color, imprints worn but mostly legible, including patent dates and arrow on filler knob. Filler knob end has been shortened by about 5 mm, possibly due to breakage of the original end notch. #2 nib has surface roughness, but is a wonderful, soft writer; pen is mechanically sound and filler works perfectly. Waterman pump-fillers are hard to find, but are truly rare in mottled. 11590: Waterman 18 SF: extremely rare black chased hard rubber sleeve-filler, 15.4 cm long; well-used, with sleeve imprint barely visible, chasing worn, two cracks in cap lip stabilized by insertion of a metal ring inside the cap (see details), surface of hard rubber has been chemically reblackened. Waterman sleeve-fillers are uncommon in any size, but are almost never seen in sizes larger than #5. This is only the third #8-size we have seen in the last 20 years. 13299: Waterman combination: rare model, not catalogued or advertised, based upon the 32, black celluloid lever-filler, 14.7 cm long, chrome plated trim, barrel threaded at both ends, fully imprinted, pencil mechanism uses 1.1 mm lead, nib is a classic Waterman semistub, smooth and responsive. Overall appearance excellent, but clip slightly loose. 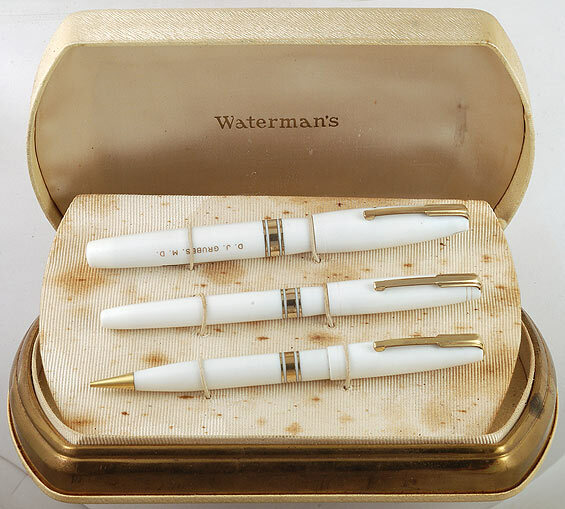 12946: Waterman Hundred Year set in box: very rare white Lucite doctor's pen with matching pencil and thermometer case, lever-filler, 13 cm long, gold filled trim; pencil uses .9 mm lead, thermometer holder lacks thermometer, has depression in barrel right below bands. Pen has stress marks in cap threads and at top of cap, very typical for this material. In original box with papers and gift card (the spelling of the recipient's name appears to have been a bit off, as there is a partial effort to scratch away an extra "S" on both pencil and thermometer case. 11209: Zerollo Duo Color in box: legendary two-nibbed Italian pen in smooth black hard rubber, 13.1 cm long, gold filled trim, good strong cap imprint, clean original box. 11815: unmarked figural pencil: a rare and desirable American-made ringtop magic pencil in the form of an owl, 3.3 cm long retracted, 6.1 cm extended, gold filled trim, lapis blue celluloid body, red (ruby?) eyes; excellent detail and workmanship, probably Fairchild or Aikin Lambert, uses standard 1.1 mm lead. Action is a bit sticky but mechanism fully functional, usual age shrinkage to body has led to the side seam opening on one side and partially opening on the other (see details). 11906: unmarked novelty dip pen and pencil: wooden souvenir in the form of an umbrella, 28.2 cm long, shaft pulls out to reveal dip pen, tip of umbrella covers clutch pencil nozzle, uses 2 mm lead; fabric cover to body, shaft hand-carved "WASHINGTON D. C.", painted papier-mache cherries attached. 7189: unmarked dummy display pen: heavy solid rubber, 13.9 cm long, looks like slip-cap eyedropper-filler but does not open. 13474: unmarked novelty pencil: giant nickel-plated brass mechanical pencil, 20.5 cm long, probably German-made, uses 3 mm lead; hexagonal barrel, some plating wear but no dings, perfect working order. 10602: unmarked novelty pencil: nickel plated brass, 9.6 cm long, in the form of a large screw; the head turns to extend and retract the lead. Uses standard 2.0 mm drafting lead, Cross made similar pencils, but could also be English. 10951: unmarked Graf Zeppelin dip pen: rare figural holder, made to commemorate the Graf Zeppelin's visit to Estonia in 1930; .875 fine silver, Estonian hallmarks, 14.8 cm long excluding nib, nicely detailed, excellent quality; discreet engraving on top, fine example lacking the usual deep nicks and dings.